Mount Evans Roadway Highest paved road in America Elevation 14120 7 of 10 cycled to summit. An eager and enthusiastic group of new and young cyclists had a wonderful experience in the beautiful mountain ranges of Vermont, New Hampshire and Maine. We biked in the Green Mountains, White Mountains, Acadia National Park and finished in the northeasternmost town in America along the Canadian border. A day's hike on the Appalachian Trail was a highlight for many. These kids will be with us for a long time! The first century ride (100 mile day) for the girls in PYL history was accomplished on the 5 day trip to beautiful Niagara Falls. We were fortunate to have competitive cyclist Shequaya Bailey join us and she was wonderful teaching and inspiring the girls to continually reach for a "higher standard." ANOTHER PYL ADVENTURE! This spectacular one had been filled with ad seriatim national park visits including The Great Sand Dunes and The Black Canyon. As if climbing The Rocky Mountains wasn't enough to build character having wonderful bologna sandwiches on the side of barren roads is. Needless to say this great trip is an incredible opportunity for the youth of Pittsburgh. A tremendous trip with a strong and enthusiastic group of achieving girls cycled from Pine Grove Furnace State Park PA to Island Beach State Park NJ. A courageous group of girls braved very cold and windy March days cycling to Rehobeth Beach Delaware in a trip that established girls on the PYL horizon. Most girls plus others joined us again in May for some beautiful and warm days to the Jersey beach! A young and admittedly struggling group of new cyclists attempted to ride Iowa, Nebraska and South Dakota without too much success. The triumphant ride up to Mt Rushmore for those still cycling was inspiring. A specially selected group of wonderful kids cycled tough days in the land of the midnight sun. These youths had the good fortune once-in-a-lifetime- opportunity to see 800+ miles of Alaskan mountains, glaciers, lakes and wildlife pedaling with pride at their accomplishment. PYL led 2 winter trips in December- each imbued with positive spirit & great times. It was quite chilly upon our return to the Blue Ridge(once again!) & sunny on the beach at Tybee Island Georgia. The second trip was mostly along the Atlantic Coast reaching Rehobeth Beach, Ocean City & Chincoteaque Island. The staff continued the long-standing PYL tradition of whooping the kids in beach football remaining undefeated all-time on bicycle trips. We returned to West Virginia for the 6th time & finally caught the beautiful fall colors & wonderful weather in Cooper's Rock, Blackwater Falls & Seneca Rocks. The large group of kids were joined by 10 adults who have been supportive of PYL's endeavors for many years. The largest group in PYL history cycled from Pittsburgh to the Outer Banks of North Carolina with a few days along the Blue Ridge Parkway (once again!) We were led all summer by a tremendous staff of former kids now grown into achieving college students & excellent mentors & role models for the new kids. PYL goes out of the country for the first time cycling from Pittsburgh to Quebec. We experienced many wonderful sites along the way including the Allegheny National Forest, the Canadian Niagara Falls, Ontario & the mountains of Quebec in the rain! The Upper Peninsula of Michigan was incredibly serene only to be matched by idyllic days cycling along the north shore of Lake Superior in Minnesota. How educational an experience does a Smoky Mountain to the Civil Rights Institute in Birmingham Alabama by bicycle sound? Exceptional! New states & new experiences for our kids as we cycled Mississippi, Arkansas,Louisiana,Texas & Oklahoma during school winter vacation. Another year, another SBA to finish off PYL's biggest and baddest year to date. We're so proud of our new riders, we're sure there're big things in store for each of them. Thanks for supporting PYL! An all-star group of PYL veterans accepted the challenge of cycling across America in 39 days. This enthusiastic & strong team of cyclists accomplished their goal riding from the Oregon Coast to the Jersey Shore. A documentary film of this adventure has been produced by 4TWELVE PICTURES & is presently awaiting acceptance by America's leading film festivals. A lucky group of kids had the pleasure of spending winter vacation cycling through the Everglades National Park & follow route 1 to the southern-most point in the US.....Key West. We had wonderful weather, calm wind, beautiful ocean sights & an enthusiastic group of kids. The Blue Ridge Parkway is often described as one of America's most scenic roads. PYL kids will remember not only the awesome views but mainly the 48 000 feet of aggregate vertical climbs! This, our third visit to the majestic beauty of the Blue Ridge Mountains, will certainly not be our last. The Rockies speak for themselves. We cycled from Pittsburgh to the Outer Banks in North Carolina. 568 miles in 7 days. Wonderful group of kids. Strong cyclists. The ocean was cold. PYL returned to the beach with the 8th annual SBA.....this year cycling from Pittsburgh to Atlantic City. Lots of rain, Pennsylvania hills & long days but this happy group of kids dove into the ocean with great joy & gusto! Can a team of kids & staff cycle from Pittsburgh to Niagara Falls in one day in a sprint relay fashion? Two teams consisting of 4 kids & 4 staff departed Pittsburgh at 530am & reached the falls at 1015pm riding 5-6 legs each at top speed. The distance of 240 miles was covered in one day.....participant Darrell Rodgers birthday. The "race" was won by the kids team in an act of extreme kindness by the staff! 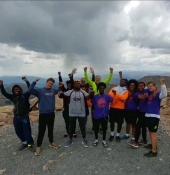 PYL fully displayed the ambitious, bold & demanding nature of our programs with a 953 mile ride from the high mountain desert of Nevada & Idaho to the snow-capped Rocky Mountains of Wyoming to our finish line at Mt Rushmore in South Dakota. This tremendous group of cyclists climbed 3 peaks in excess of 8400 feet, rode in 104 degree heat, cycled in the Grand Tetons & Yellowstone & thoroughly enjoyed an experience of a lifetime. 2013 PYL Spring Trip 10 kids...DJ, Maquale, Marquis, Dre, Lawrence, Gene, Mentchaas, Darrell, Hassain, Cody. 2 excellent staff...Peter (retired banker) & Jake (son) Trip highlights included 12 inches of snow in St Louis, 2 days cycling in low teens wind chill, 3 beautiful sunny days in Mississippi, staff plus v kids football game on U of Mississippi campus, visit to the National Civil Rights Museum & Lorraine Motel in Memphis & the 1st NBA game in PYL history. Kids demonstrated great attitudes & determination in cycling in some tough weather, just seemed to be having lots of fun, learned a great deal of history & made the trip wonderful for all! Thanks once again for your support. PYL returns to the Blue Ridge Mountains greeted by blue sky sunny days while being escorted up & down major mountains by deer, hovering hawks & lurking bears! Kids are enthusiastic, tremendous cyclists & having the adventure of a lifetime. Thanks to all. South Carolina, Georgia, Florida - Sunshine, Wonderful Kids, Great Cycling. This scenic route took us along the Arkansas River in the Bighorn Sheep Canyon on a day with at least 25 weather changes fron intense sun to 3 rainstorms to a chilly mini-hail storm. Salida sits at 7000+ feet nestled among snow banked 11000+ peaks. Kids wonderful, strong & having lots of fun,adventurous & educational experiences. Enjoy the photos & thanks for your support. .....and we are back on the road! new kids/ new adventures Iowa to Pittsburgh in the heat crossed the Mississippi River this evening after lots of cornfields and a small town Iowa waterslide park that was just wonderful.